South Africa's deep mines are dying - but these companies are set to profit big time! 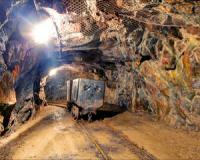 South Africa sits with the ‘achievement' of having 8 out of the world's ten deepest mines. While this is clearly an achievement in engineering - it's a problem specifically for our gold mining industry. Production costs have skyrocketed, accidents in the deep mines make it even more difficult to profit. In fact, in the 1970's South Africa produced as much as 80% of the world's gold, today it's the 7th largest producer in the world! Harmony Gold's profit for the past year was lower than it was in 2012 - and the gold price today is basically at its highest levels ever (in rand terms)! Here's the three mining firms I would buy in a heartbeat! I’m looking for 300 investors to get started with this right away – as soon as I get your permission to post you one thing that isn’t available anywhere else... get started with this right away – as soon as I get your permission to post you one thing that isn’t available anywhere else..
Pan Af announced results on 21 September. It increased gold sales from 5,470kg to 6,374kg. Revenue shot up 43.1% from R2.5 billion to R3.6 billion. The company also managed to lower production costs by 3.2% to R338,242/kg. The current gold price is at R580,000/kg. So Pan Af pockets around R242,000 profit for every kilogram of gold it produces. Thanks to the strong cash flow the company produces at the current gold price, it has big growth plans. The company is busy with a feasibility study into the Elikhulu project. This project contains 1.7 million ounces of gold (or 52,877 kilograms). At the current profit Pan Af makes per kilogram of gold, this project could net the company R15 billion. It could add R400 million profit to the company’s bottom line per year! What sets Elikhulu apart is the fact that it's a surface treatment facility. It will produce gold from years and years’ worth of dumped mine material which still contains significant amounts of gold. And the estimated cost of production could be below $650/ounce! In the coming year, the company will give more information on this project, and set a date for its construction. When this happens, there’s massive upside potential for Pan Af. You should receive a 15.375cps dividend from the company by year-end. “I think I'm ready to make profit now. I really liked the trading strategies” Petrus. The numbers speak for themselves - join them today! Jubilee Platinum listed without a single operating mine. It raised cash from investors and dabbled with a couple of mining projects, but never moved into an operational mining company. Then, late in 2015 Jubilee identified an old mine dump containing significant amounts of platinum at the Dilokong Chrome mine. It reached an agreement with the owners of the mine – who have a mining licence to produce chrome. It applied to the department of minerals and energy for a mining right to produce chrome and platinum. And as that got approved it built a plant that could first extract the remaining chrome from the dump material. And then extract the platinum. By June 2016 this project exceeded expectations by producing 50% more chrome a month than was planned for! What’s more, it covered operating costs and made a profit from its chrome sales alone! It’s still stockpiling the platinum concentrate it produces – with the aim of selling that later on. Once this happens the profits will come flying in! This project is already making around R5 million a month in profit. On a yearly basis that’s R60 million or 6 cents per share. Hernic Ferrochrome is the fourth largest ferrochrome producer in the world. And its tailings dump is supposedly the largest chrome tailings dump in South Africa. So Jubilee met with Hernic’s owners, the Japanese firm: Mitsubishi. They also came to an arrangement, and now Jubilee is in the process of building South Africa’s largest chrome tailings processing plant. It will process 55,000 tonnes of material from the dump per month. From this material, it will at least be able to produce enough chrome for breakeven on its operating costs. And on top of that, a whopping 31,000 ounces of platinum a year. The company expects the platinum will be pure profit. And it’s thanks to the lazy man’s strategy I want to share with you. Wescoal finished the construction of a new mine in the past 12 months and started production from it. Thanks to this, the tiny miner has been able to aggressively grow its profits. It increased profit after tax by 78.8% to R51.8 million compared to R29 million in the previous year. Earnings per share also hit 27.1cps - putting the share on a low PE of 6. It's up 108% in the past six months - but I see more share price growth as it will see higher earnings in the year to come as well! The company just announced a BEE deal. Wescoal needed its key mine, Elandspruit, to have a secure contract with Eskom. Eskom required black-ownership of Wescoal in order to do this. The IDC will fund the deal and it brings more than R178 million additional cash to the table. I believe Wescoal could use this cash, and some of its own debt for acquisitions in the junior mining sector. Keaton Energy, in close vicinity to some of Wescoal’s operations is on a market cap of R154 million for instance. There are also a number of adjacent properties to its own operations that Wescoal could buy. Keep an eye on this on.